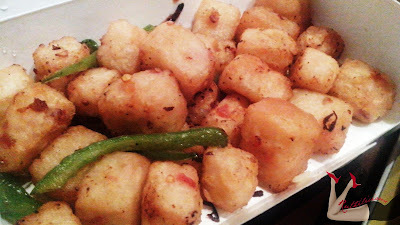 Last Sunday, I gave the woman of the house (my mom) a day off from the kitchen and ordered dinner through Foodie.ph. Even if I had spent a good time in the kitchen back in College, cooking is not one of the most fun activities for me (probably because of the thought of hot pans and sharp knives). For my mom who cooks alot of good dishes, it is a challenge for her to come up with new dishes everyday - so Foodie.ph is indeed a saviour last weekend. 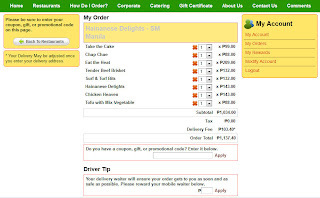 Foodie.ph is a new online delivery site that offers services 24/7 with different partner restaurants. 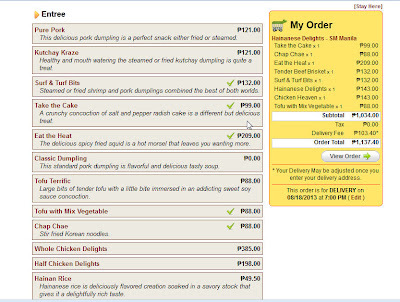 I love that the minimum amount you need to order is only Php300 but of course with additional delivery charge. I don't really mind the delivery charge especially if you feel too comfy at your home while watching DVD and bonding with your family - all you need to do is order online and wait for someone to ring the doorbell. How to Order at Foodie.ph? 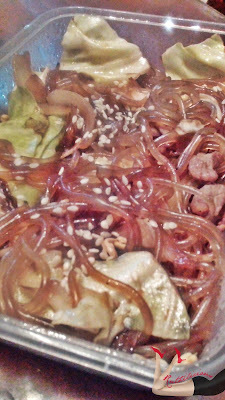 Click Read More to know more about Foodie.ph! 1. 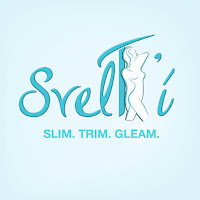 First, make an account, as email and order confirmation will be sent to you via this email address. 2. You are ready to order! 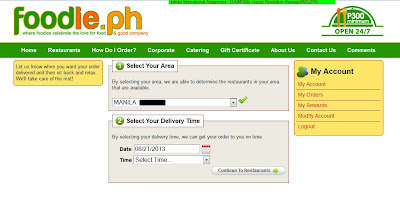 Select your location first, and choose the date and time of delivery. I love this option that you can select the date and time. I actually ordered in the wee hours of the morning and I immediately received confirmation via email. Wow! 3. Then, the fun part - let's choose some good food! Based on your location you will be presented with list of restaurants and fast food chains which can deliver to your area. 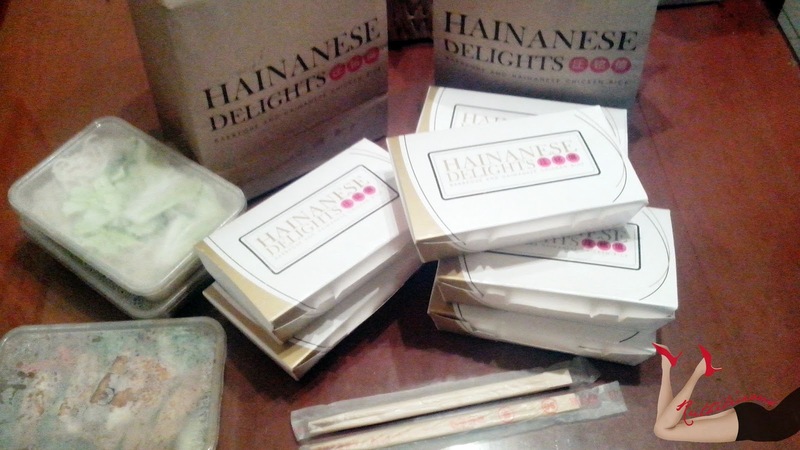 I chose Hainanese Delights because I am sure my family would want normal meals for dinner. 4. As you scroll up and down the menu, you can see the list of food that you have ordered and how much in total. There is even a portion on the food section where you can specify special requests, say if you have allergy with certain food - like my friend who doesn't like much garlic. 5. 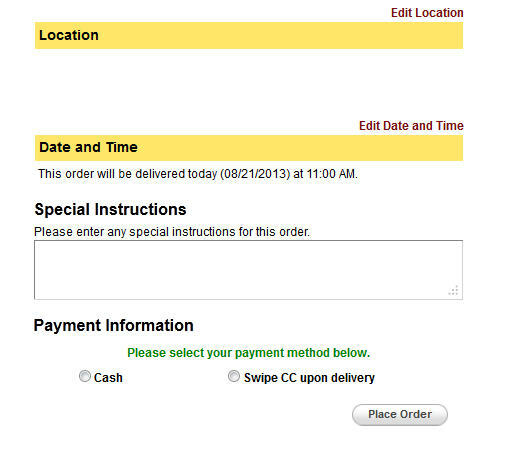 Once you are ready to go, click View Order, and you can see the summary of your orders. I love that box where you can input the amount for driver's tip! 6. 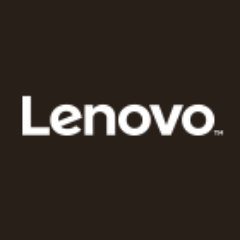 Proceed to check out and confirm your delivery address. You may even add instructions to better help the driver locate your place. Then choose mode of payment. 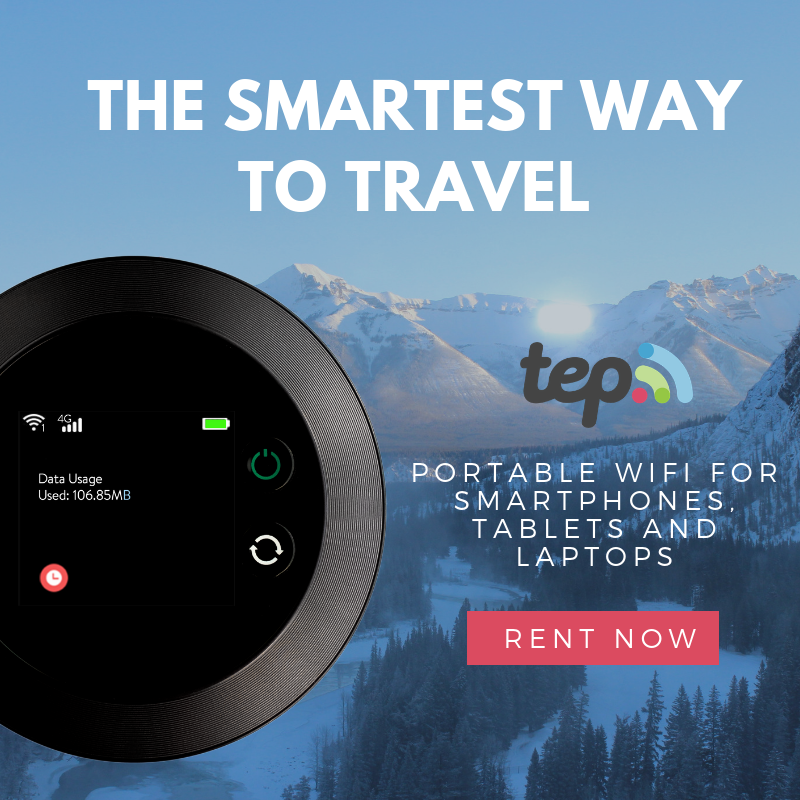 There is an option to swipe your Credit Card upon delivery - probably they have a terminal like the one I used in Frankie's Tomatoes! After a few minutes, I received an email confirming my order. That was fast! And this is not just any automated system notification. So my Sunday went by and come 5:45 PM I was advised by my dad that I have a visitor. It is as if I was waiting for a suitor.. the delivery arrived 45 minutes ahead of the schedule. It is not a bad thing but I am thinking that is too early for the preferred time. What if we were out and no one's home until 6:30 PM? It would have been good if delivery will come nearer the preferred time (15 minutes earlier is good, but 45 minutes is too early). Anyway, I am glad that Mr. Delivery Guy came like a knight in shining armor - in that case, not-so-waterproof raincoat. It was rainy that evening and I can feel the trouble he had gone through to get the food to our home. He handed me these 3 paper bags! 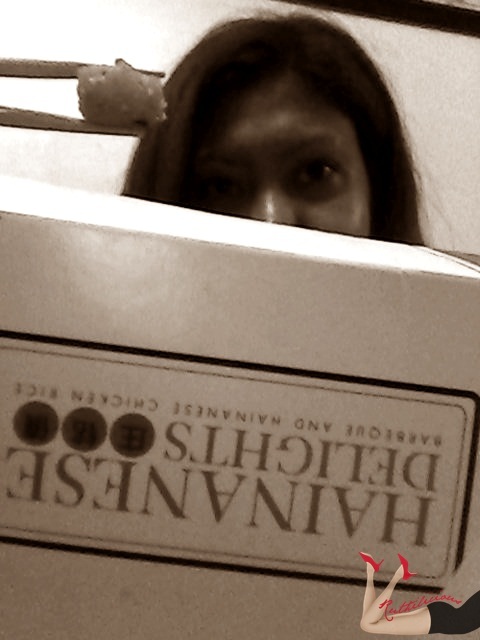 I looooove that Hainanese Delights considers the planet! When I took out the boxes .. I realized I ordered alot! The food was still warm and I could smell the chili and spice of the dishes when I took them out! I was ready to take a bite and forget about taking pictures, but I thought of sharing the experience with you. Sorry, I had to use my phone's camera, as my camera died on me (again). Well, what do we have? Hainanese Chicken of course! This set meal is so affordable. I just placed it on a plate to give it a good presentation. 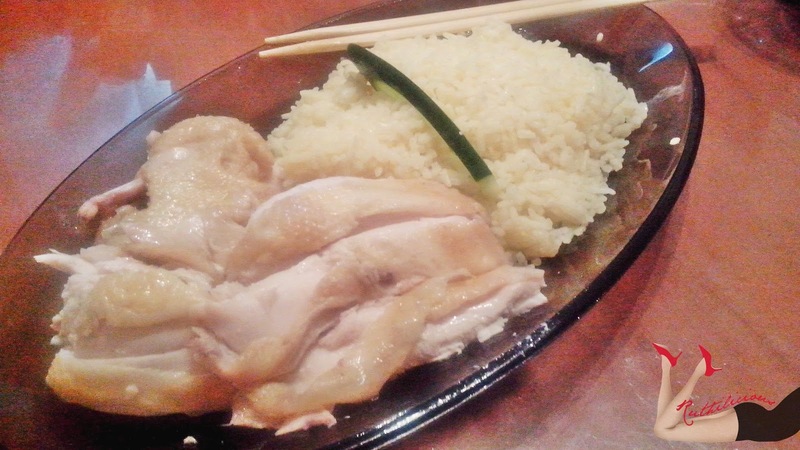 The rice is just half of what is included in the meal. 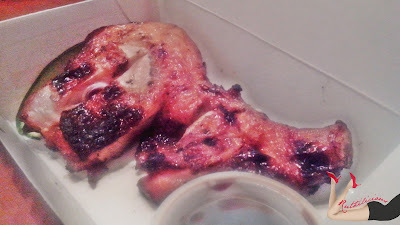 For only Php143, it is a good meal but I cannot confirm if it is close to the real Siingapore's specialty chicken. I cannot remember how the Hainanese Chicken is supposed to taste, it's been years since I was in Singapore. It is tender and flavorful though. I cannot complain.. Plus the serving is generous! I also ordered Chicken Heaven (Php143) - barbeque'd chicken with sweet bbq sauce. This also comes with rice and same size serving as the Chicken Delights. I love the crunch factor of the roasted parts of chicken, especially if you use the soy dip. 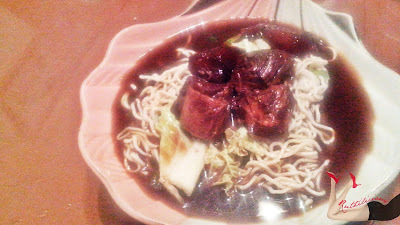 The Tender Beef Brisket (Php132) is what we all love! She's the star! Probably because it was rainy and we wanted a good soup to warm us up! Surprisingly, the broth is still warm when it was delivered - we didn't need to hear it in the microwave. The bowl is good for sharing. I know I am not giving justice to the food with my pictures.. but anyway.. 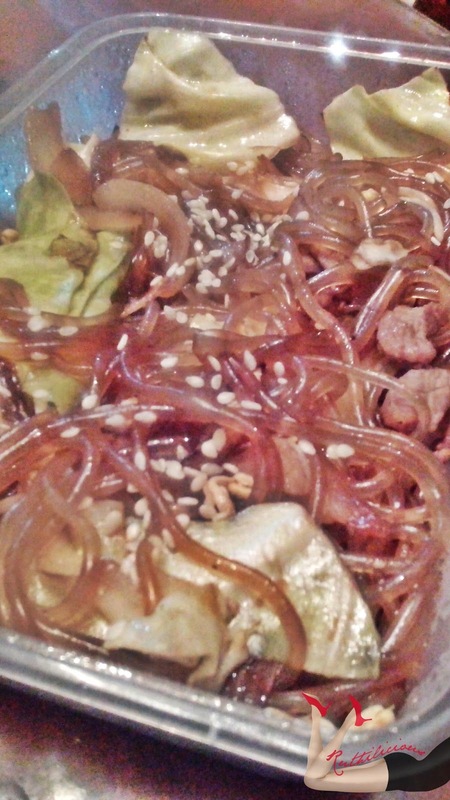 I also ordered Chap Chae (Php88) just to taste their version - and it is like any other Chap Chae I have tasted. 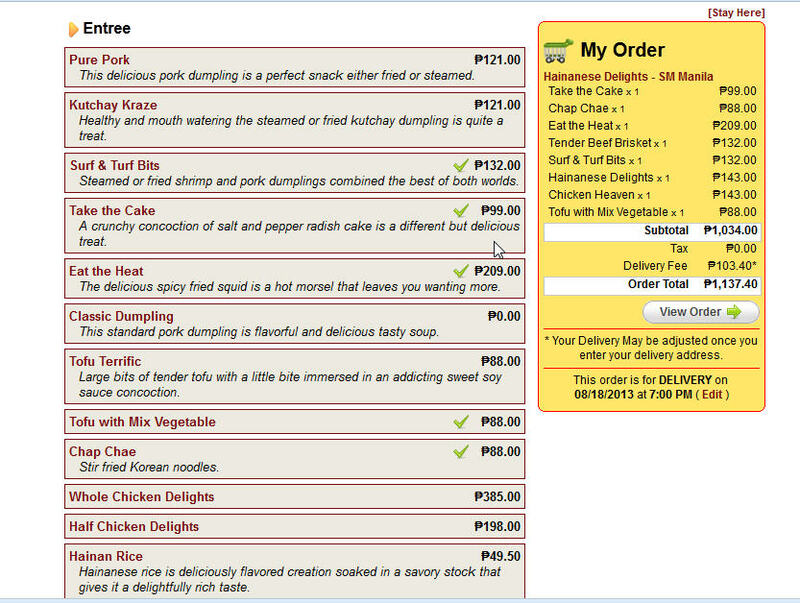 It is good to be eaten with Take the Cake (Php99). Would you believe when I say, it is Radish? Well it feels like Chicken Nuggets when you eat it. Lightly salted and peppered with nice greens to balance the flavor. It might goes well with cold beer. 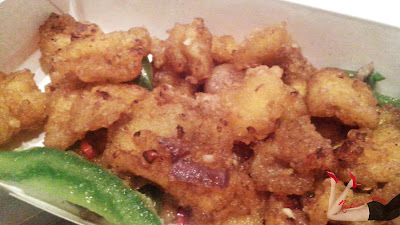 The Eat the Heat Php (Php209) is spicy fried squid - and when I say spicy, it is spicy! I like it! The squid is chewy and didn't threaten my braces. I love the addition of bell peppers which balances the spiciness. 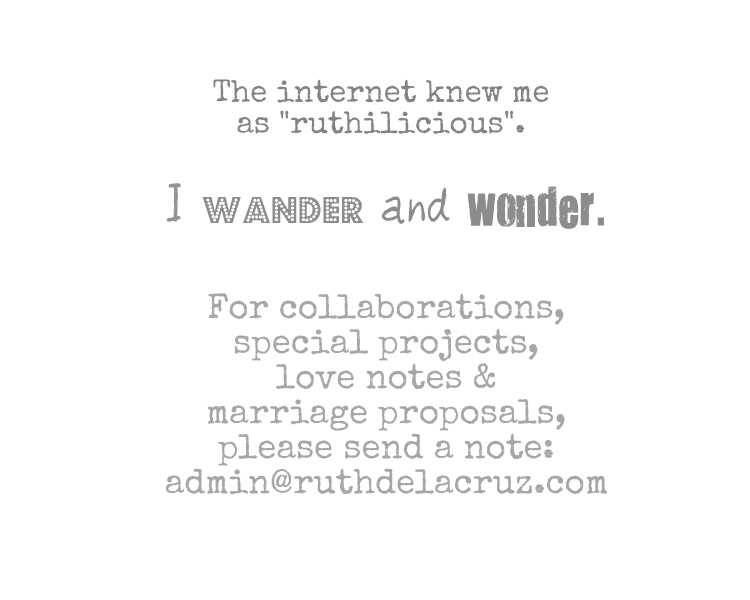 The Surf and Turf Bits (Php132) is also my new favorite. 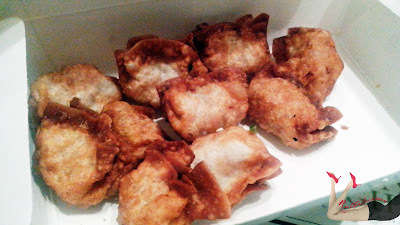 These are shrimp and pork dumplings and you have an option to choose fried or steam. I ordered fried being the unhealthy person that I am. It is perfectly fried golden brown keeping the meat fresh inside but with a crunch. I dipped in soy dip with ginger shreds and it is spells perfect. I am not a ginger person, but for some reason, I am digging the combination. 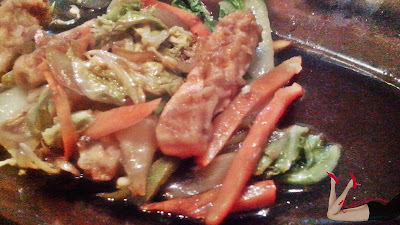 I also ordered for Tofu with Mixed Vegetables (Php88) in the attempt to come up with such a healthy balanced meal. Overall, the food is good - nothing superb but fairly affordable for a quick healthier meal - rather than ordering from fast food chain. There was so much food for the 3 of us at home, that we were able to store leftovers and ate them last Monday (oh, we hate the rain!) - but thanks Hainanese Delights and Foodie.ph for keeping us alive! Maybe next time I will try the other partner restaurants from the foodie.ph site. Watch out for the review. And here's my most unflattering selfie enjoying the meal.. Oh, I loooove lazy Sundays! 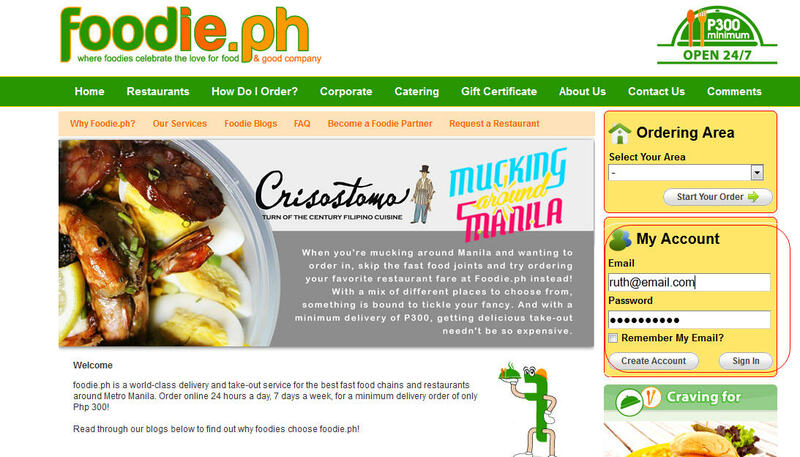 If you are looking for food delivery service that is open 24 hours, head over to www.foodie.ph. 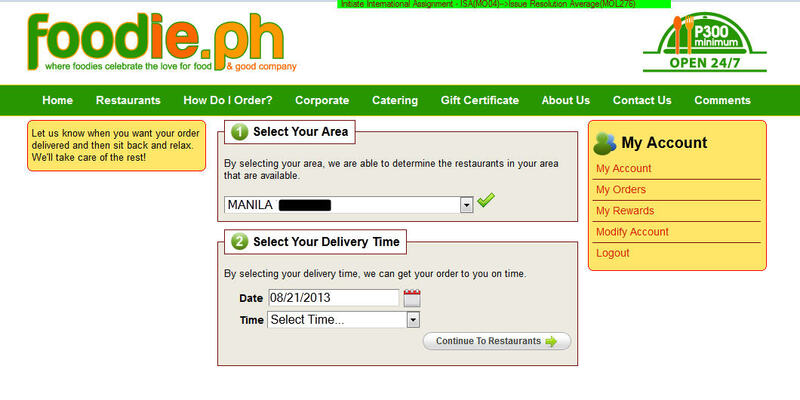 Please note that delivery schedule depends on the partner restaurant. 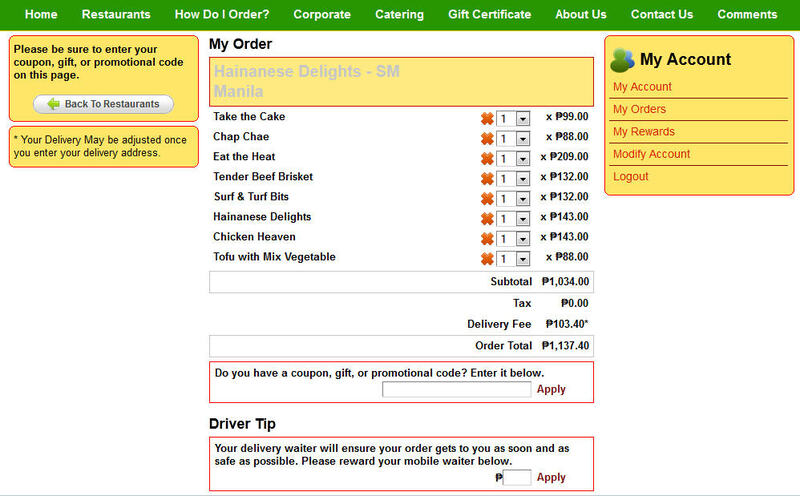 Have you tried ordering from foodie.ph? 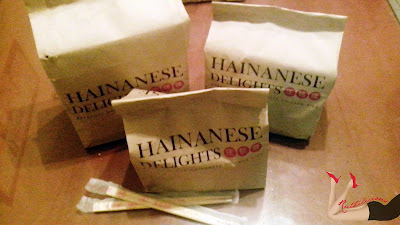 Have you tried Hainanese Delights?